Beth’s career path has been a long and winding one. In another lifetime, she worked as an environmental lawyer with a focus on land conservation and sustainable agriculture. Cheese turns out to involve those things and more, so here she is. 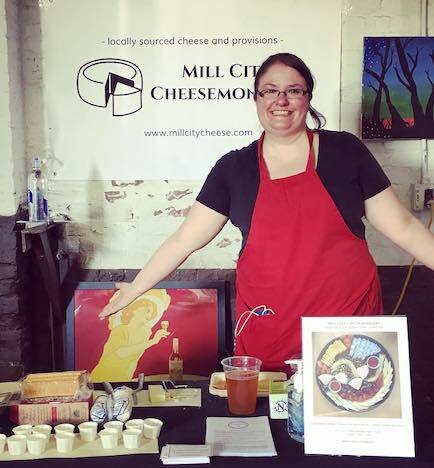 Beth is the former Executive Director and a current member of the Board of Directors of the Massachusetts Cheese Guild, and she loves to talk about cheese trivia and culinary history. Her favorite cheeses are super-gooey bloomy rinds and anything made with sheep’s milk. If your dog or young child likes cheese, Beth will happily provide samples and lots of attention. Marianne is a cheesemonger, a cook, a writer, a reader, a knitter, and a lover of all Alpine cheeses. She’s the person to ask if you want to know what’s happening in the Lowell arts community or where to find an interesting new restaurant. Look for her recipes in the shop newsletter! Jen is a scientist, a beer nerd (actually, just a nerd in general), a mom, and our most reliably cheerful monger. You can hear her laugh throughout Mill No. 5, and she never fails to greet customers with enthusiasm. Tell her a goofy cheese joke - she’ll laugh even if she’s heard it a million times. In addition to her overall bubbly demeanor, Jen is famous for her distinctive fashion choices (dinosaur leggings, anyone?) and product descriptions. It’s because of her that people come in to the shop asking for “cheese clouds” when they want Aussie Magic.